"A concrete building is very strong – too strong for the human body. I think the human body is very week and fragile. So people can’t feel comfortable in strong places. However if the building itself is as weak as the human body, we feel at ease." Kengo Kuma (born 1954 in Kanagawa, Japan) is a Japanese architect. After completing his master studies in architecture at the University of Tokyo in 1979, he worked for a time at Nihon Sekkei and TODA Corporation. He later moved to New York to study at Columbia University as a visiting researcher from 1985 to 1986. In 1987, he founded the Spatial Design Studio. 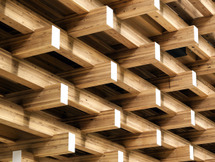 In 1990, Kengo Kuma & Associates, his own studio was established. During the 1998–1999 academic year, he was a visiting professor at the Faculty of Environmental Information at Keio University. In 2008, Kuma earned a Ph.D. from Keio University. Kuma's stated goal is to "recover the tradition of Japanese buildings" and to reinterpret it for the 21st century. To achieve this goal Kengo Kuma takes his inspiration from light and nature.